Boron (chemical symbol “B,” atomic number “5”) is a chemical element that is classified as a metalloid—its chemical properties are intermediate between those of metals and nonmetals. It can take the form of a brown, amorphous powder or a hard, black, crystalline material. The element is not found free in nature but occurs abundantly in the ore borax. Elemental boron is used as a dopant in the semiconductor industry and as a material that produces a green flame in pyrotechnic flares. Boron filaments are useful for making composites for advanced aerospace structures, golf clubs, and fishing rods. Boric acid is used in textiles and insecticides, and borates are used in making insulating fiberglass, laundry detergents, antiseptics, adhesives, and a variety of other products. The isotope boron-10 is used to control reactions in nuclear reactors and as a shield against radiation from radioactive materials. Boron is an essential plant nutrient, but its physiological role (if any) in humans and animals is poorly understood. The element is nontoxic to humans, and common compounds (such as boric acid and borates) have low toxicity, but some specialized boron hydrogen compounds are toxic and highly flammable. 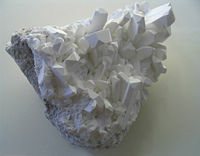 In nature, boron does not appear in elemental form but is found combined in borax, boric acid, colemanite, kernite (rasorite), ulexite, and borates. Boric acid is sometimes found in volcanic spring waters. Also, a boron-containing natural antibiotic named boromycin has been isolated from Streptomyces. Economically important sources of boron are kernite and borax ores, both of which are found in the Mojave Desert of California, with borax being the main source there. Extensive borax deposits are also found in Turkey. The United States and Turkey are the world's largest producers of boron. Compounds of boron have been known for thousands of years. The name boron can be traced to the Arabic buraq, Persian burah, and Turkish bor, which are words for borax. In early Egypt, the process of mummification depended on an ore known as natron, which contained borates as well as some other common salts. Borax glazes were used in China from 300 C.E., and boron compounds were used in glassmaking in ancient Rome. The element was first isolated in 1808 by the English chemist Sir Humphry Davy and independently by French chemists Joseph Louis Gay-Lussac and Louis Jacques Thénard. By reducing boric acid (H3BO3 or B(OH)3) with sodium or magnesium, they obtained boron at about 50 percent purity. It was not until 1824, however, that boron was recognized as a chemical element by Jöns Jakob Berzelius. It is generally thought that the first pure boron was produced by American chemist W. Weintraub in 1909, but some researchers have cast doubt on the accuracy of that claim. Pure, elemental boron is not easy to prepare. When boric acid is melted, it is converted to boron oxide (B2O3), which can then be reduced with a metal such as magnesium or aluminum. The boron produced, however, is almost always contaminated with the metal boride. Pure boron can be prepared by reducing volatile boron halogenides with hydrogen at high temperatures. Highly pure boron, for use in the semiconductor industry, is produced by the high-temperature decomposition of diborane (B2H6), followed by what is called the Czochralski process. In the periodic table, boron is situated at the top of group 13 (former group 3A), just above aluminum, and in period 2, between beryllium and carbon. It is classified as a metalloid. Boron exists in different allotropic forms. Amorphous boron is a brown powder and is produced by certain chemical reactions. It contains boron atoms randomly bonded to one another, without long-range order. By contrast, crystalline (metallic) boron is black in color and extremely hard (9.3 on Mohs' scale). It has a high melting point and exists in many polymorphs—forms of boron that differ in their crystal lattice structure. The best characterized crystalline forms are: two rhombohedral forms, α-boron and β-boron, containing 12 and 106.7 atoms in each rhombohedral unit cell, respectively; and a tetragonal, 50-atom form. These forms are somewhat analogous to diamond crystals, but unlike diamond, boron has various possible structures because each boron atom can form three bonds, forcing the atoms to be asymmetrically bonded in three-dimensional space. Crystalline boron can transmit infrared light. At standard temperatures, it is a poor conductor of electricity, but it becomes is a good conductor at high temperatures. Boron is similar to carbon in terms of being able to form stable, covalently bonded molecular networks. On the other hand, each boron atom has one less electron than a carbon atom, and boron behaves as an electrophile—it seeks to form a covalent bond with an element that can provide a pair of electrons to form the bond. The reactions of boron are dominated by this requirement for electrons. Based on this property, boron is called a Lewis acid. There are 13 known isotopes of boron. Two stable isotopes occur in nature: 11B (about 80 percent) and 10B (about 20 percent). Also, 11B is a by-product of the nuclear power industry. The shortest-lived isotope is 7B which has a half-life of 3.26500x10-22 seconds and decays through proton emission and alpha decay. The 10B isotope is good at capturing thermal neutrons, such as from cosmic rays. It then undergoes nuclear fission, producing a gamma ray, an alpha particle, and a lithium ion. When this happens within an integrated circuit, the fission products may dump charge into nearby chip structures, resulting in data loss. To avoid this effect in critical semiconductor designs, "depleted boron" (consisting almost entirely of 11B) is used. Boron nitride is a material in which the extra electron of the nitrogen atom (compared to a carbon atom) in some ways compensates for the boron atom's deficiency of an electron (compared to carbon). Boron nitride can be used to make crystals that are extremely hard—second in hardness only to diamond. Also, like diamond, boron nitride acts as an electrical insulator, but it is an excellent conductor of heat. Boron nitride nanotubes can be constructed in a form analogous to carbon nanotubes. There are several hundred uses of boron and its compounds. Some of the notable ones are highlighted below. Amorphous boron is used in pyrotechnic flares, to produce a distinctive green flame. In trace amounts, boron is used as a dopant for P-type semiconductors. Sodium borate decahydrate (Na2B4O7 • 10H2O, or borax) is used in laundry detergents, antiseptics, adhesives, and anti-corrosion systems, among others. Boric acid is also traditionally used as an insecticide, notably against ants and cockroaches. As boron is an essential plant micronutrient, borates are used in agriculture. Compounds of boron are used extensively in organic chemical syntheses. For example, sodium borohydride (NaBH4) is used for converting aldehydes and ketones to alcohols. Some compounds of boron are used in the manufacture of borosilicate and borophosphosilicate glasses. Other compounds are used as wood preservatives, and are particularly attractive in this regard because they have low toxicity. Given the ability of 10B to capture thermal neutrons, this isotope is used to control reactions in nuclear reactors, as a shield against radiation and in neutron detection. Purified 11B ("depleted boron," separated from 10B) is used for borosilicate glasses in "rad-hard" (radiation hardened) electronics. Sodium borohydride (NaBH4) is a popular chemical reducing agent. For example, it is used for converting aldehydes and ketones to alcohols. Boron filaments are high-strength, lightweight materials that are chiefly used in composites for advanced aerospace structures. They are also used in such items as golf clubs and fishing rods. Boron compounds are being investigated for use in a broad range of applications, including as components in sugar-permeable membranes, carbohydrate sensors, and bioconjugates. Some boron compounds show promise in medicine, for drug delivery and treating arthritis. A medical application being investigated is neutron capture therapy for treating tumors. If a compound containing 10B is attached to a tumor and the tissue is exposed to a low dose of thermal neutrons, the 10B absorbs neutrons and releases short-range alpha radiation. This radiation kills the tumor cells. Hydrides of boron are oxidized easily and liberate a considerable amount of energy. They have therefore been studied for use as possible rocket fuels, along with elemental boron. However, issues of cost, incomplete combustion, and boric oxide deposits have so far made this use infeasible. Boron occurs in all foods produced by plants. Its nutritional value has been argued since at least 1989. The U.S. Department of Agriculture conducted an experiment in which postmenopausal women took three milligrams of boron a day. The results showed that boron can drop excretion of calcium by 44 percent, and activate estrogen and vitamin D.
Elemental boron is nontoxic and common boron compounds such as borates and boric acid have low toxicity (approximately similar to table salt, with the lethal dose being two to three grams per kilogram) and therefore do not require special precautions while handling. Some of the more exotic boron hydrogen compounds, however, are toxic as well as highly flammable and do require special handling care. ↑ Hütter (1967). . Helv. Chim. Acta. 50: 1533-1539. ↑ Dunitz (1971). . Helv. Chim. Acta. 54: 1709-1713. ↑ (1970) . Z. Angew. Phys. 29: 277. Boron. Los Alamos National Laboratory. Environmental Health Criteria 204: Boron (1998) by the International Programme on Chemical Safety. This page was last modified on 20 June 2016, at 18:15.